25 years after the outbreak of war in Sarajevo traces of this human tragedy can be found all over the city. Even in the very center there are houses with bullet holes in it. 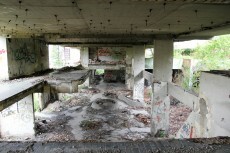 The building complex where we filmed the live session with Helem Nejse is especially damaged and run down. It is situated along Meša Selimovic Boulevard, which – together with Smaja od Bosne Street – is one of the main boulevards in Sarajevo connecting the industrial part with the old town. Because of its many high-rise buildings lined with sniper’s posts during the siege of Sarajevo the informal name for this particularly dangerous territory was “Sniper Alley”. Nowadays homeless people live in this ruin. Among the homeless rumour has it that a Turkish businessman wants to buy the run down complex. Then they will have to look out for another ruined house.